When I arrive the massive front door is open and propped invitingly ajar. The gentle murmur of conversation and musical clinking of dishes draws me into the vestibule and through to the grand foyer as I enter a turn-of-the-century jewel & dash; a magnificent brick estate facing what used to be Milwaukee’s historic Grand Avenue. Richly colored walls, plush, patterned rugs, and a grand gothic staircase that winds its way up to the second floor transport me back to the lavish luxuries of a bygone era, when the art of presentation ruled the day, and homes such as this were opulent symbols of a prospering society. The Brumder Mansion is one of a handful of stately residences still anchoring the sidewalks along Wisconsin Avenue in the city’s storied Grand Avenue neighborhood. Located just down the road from the Pabst Mansion, plans for the home were drawn up in 1902 and the lofty structure was built in 1910 by George Brumder, a successful Milwaukee businessman who owned a publishing company, for his son, George Jr. Over the next century, the Brumder family left the Mansion, and the house served as a boarding house, then a parsonage, and finally an activity center for the Lutheran church. But time took its toll on the historic home, and when Carol Hirschi first set her sights on the residence in 1997, the Mansion was far removed from its original splendor and decorum. Bedrooms had been converted to offices, the lower level billiard room was now a theater, and a small chapel had been added to the second floor. The potential was there, however, and Hirschi could see the faint glimmer of this diamond in the rough. Oak woodwork and leaded glass, a grand staircase, and a tile fireplace designed by Neideken, an interior designer who worked with Frank Lloyd Wright, all held tantalizing signs of promise. 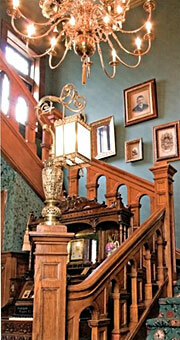 With naïve enthusiasm, Hirschi closed on the property in August, and in April of the following year opened the Brumder Mansion Bed and Breakfast with two rooms. With a background in theater, Hirschi has a flair for setting a stage that brilliantly compliments the Victorian, Arts & Crafts, and Gothic attributes of the home. The wood floors are adorned with soft oriental rugs, billowing window dressings drape the high windows, and period lighting illuminates antique furniture. 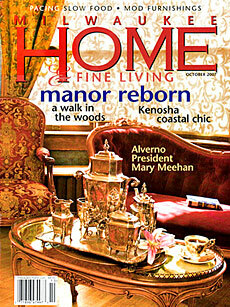 Vintage photographs and heirloom trinkets add a charming air of authenticity to the home. A lady’s plumed hat propped in the vestibule, a silver mesh clutch draped over the arm of a chair, and well-loved books on the tables make it seem as if the original inhabitants had merely stepped away for a moment. Yet Brumder is no dusty museum reconstruction. The free-flowing floor plan, the warmth of the hostess, and the comfortably plump chairs in the parlor contradict stereotypes of stuffy Victorian styles or cold, intimidating Gothic trends, and remind you that an exuberant life is lived here. The Mansion welcomes you in, and makes you feel right at home. While the décor celebrates the past, the accommodations are anything but passe. All guest rooms have a private bath, and the majority feature a Jacuzzi, whirlpool or imported marble shower. The Mansion also offers guests modern conveniences such as wireless Internet, cable television, DVD/CD players and air conditioning. Like the melange of design elements, the rooms in the Mansion range in size and personality – each with unique antique accents, backdrops and ambiance. George’s Suite, named for the former master of the house, contains three rooms and is the largest of the accommodations. 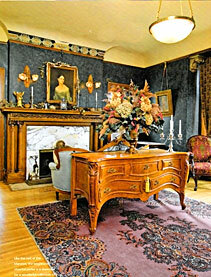 Furnished almost entirely with antiques, the suite has two ornamental fireplaces, a sitting room and a queen-size bed. The Gold Suite, showcasing an ornamental oak fireplace with fluted columns, is named for its sunny yellow decor, while Marion’s Suite features soft blues, grays, pinks and blacks. 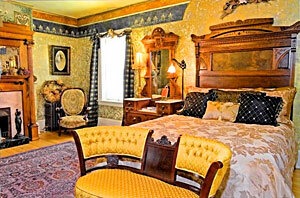 The walls in Gyneth’s Suite are faux painted in reds and yellows, and the room features a king-size bed, a gas fireplace with a 19th-century slate mantel, and a luxurious double whirlpool. Beyond the guest rooms, visitors can peruse collections of books and magazines in the library, or play one of the many board games available in the roomy parlor. Guests of the Brumder also enjoy complimentary wine and soft drinks, along with Swiss chocolates and the Mansions’ signature chocolate chip cookies. 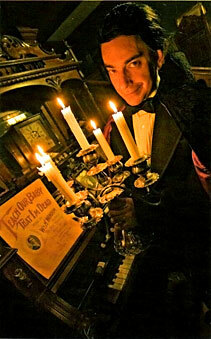 Hirschi’s theatrical interests make the Brumder Mansion an exceptional place for events. The Mansion has played host to weddings, receptions, corporate meetings and teas with the Queen, complete with her Majesty’s presence – or at least a convincing likeness. During the winter holidays, the Brumder has offered A Christmas Carol dinner show – a reading of A Christmas Carol in its entirety with full traditional English Christmas-goose dinner, hot wassail, tea and sweets. The reader? Charles Dickens himself – as portrayed by accomplished actor Stephen Parr. This September, Ghost Hunter University will visit the Brumder. During the event, which is affiliated with Haunted Times Magazine, guests can learn about ghost hunting and join in paranormal investigations. Unexplained noises, bad dreams and moved objects have given the Mansion a reputation for being haunted. 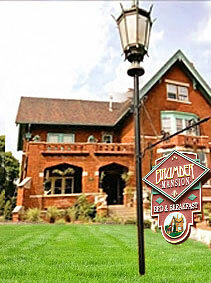 Though the events have been noted in Weird Wisconsin and listed among other haunted bed and breakfasts in the state, Hirschi assures guests that any paranormal visitors are friendly. “I think the ghosts are all theater groupies, that’s my hunch,” says Hirschi, who recently purchased the property next door and is working on an expansion of her Wisconsin Avenue offerings. Owning a bed and breakfast can be exhausting, especially one requiring the extensive renovations needed to create the Brumder’s luxurious appeal. However, Hirschi says despite its labor intensive nature, there are definite perks. “I figured if I lived where I worked, I would never be late for work,” she jokes. Another bright spot is working with her fellow hosts – her faithful dogs – who follow her around everyday, greet guests and selflessly assist with the clean up of any tasty morsel that might drop to the floor. “They are one of the amenities,” says Hirschi. As guests of the Brumder Mansion can attest, this grand old home has amenities to spare.